Happy Banana Lover's Day! No, really, it is. And I can think of no better way to celebrate this self-packaging, potassium-rich fruit (botanically considered a berry, but I'm not even going to go there today) than with rum. Why celebrate Banana Lover's Day with rum, you ask? 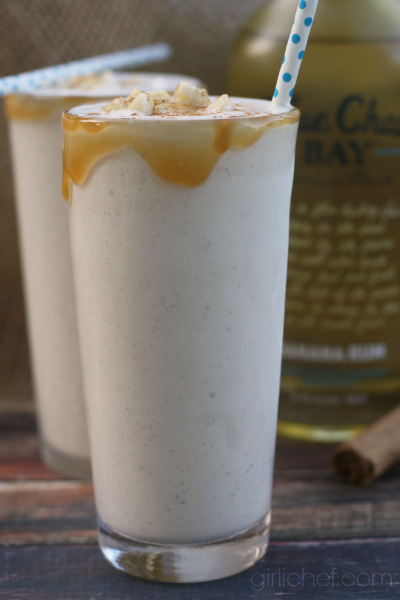 Because it's not just any old rum, it's Blue Chair Bay's Banana Rum! It all makes sense now, wouldn't you say. When Blue Chair Bay asked if I'd like to try a bottle of their newest rum, I didn't hesitate. Mainly because I'd already been eyeing it, imagining the possibilities. If you're not familiar with Blue Chair Bay Rum, I wrote a post celebrating International Pineapple Day with them back in April. I used their Coconut Rum to create a Drunken Hummingbird Cocktail. If you click through, you can catch a glimpse of this company founded by Kenny Chesney (there's a video at the bottom). You can also connect with Blue Chair Bay Rum on Facebook. Back to bananas. As I was brainstorming cocktail ideas that would highlight the flavor of the rum, I couldn't shake the thought of Bananas Foster. I know that a milkshake doesn't necessary come to mind when you think "cocktail", but it is a boozy milkshake. In its most basic form, a cocktail is a "mixture of agents" (think fruit cocktail, molotov cocktail, cranberry juice cocktail), and well, that's what this boozy milkshake is - a mixture of glorious ingredients. I took all of the flavors of the classic New Orleans dessert and blended them into one thick beverage. Ice cream, caramel, cinnamon, alcohol, and BANANAS! Classically, bananas foster uses dark rum and banana liqueur, but banana rum was a seamless substitution. It tastes just like the glorious dessert, but entirely cold (which is just fine with me since it's still sticky, sweaty hot outside). Cheers to Banana Lover's Day! 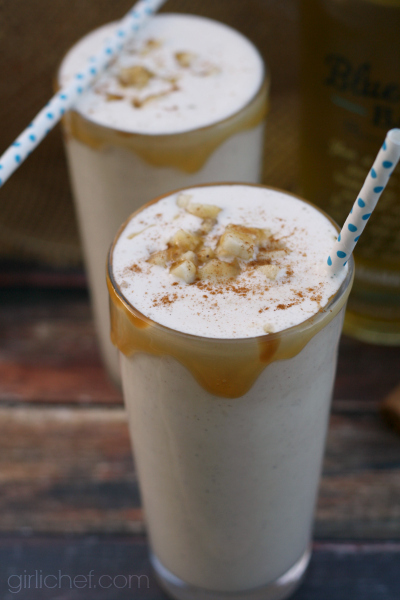 All the flavors of the New Orleans classic, Bananas Foster, in a boozy, banana rum-infused milkshake. Put all of the ingredients for the shake into a blender, put on the lid, and puree until thick and smooth. Dip the rims of 2 tall, cold glasses in caramel sauce, then divide the milkshake between the two. Garnish with some half of the diced banana, a drizzle of caramel, and a pinch of cinnamon. 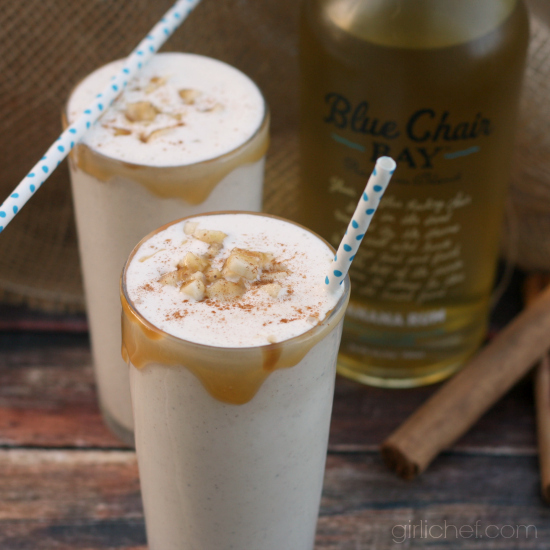 Are you imagining all the cocktail and boozy beverages you could make using Blue Chair Bay Banana Rum? If you simply must have a bottlein hand this instant, you can go to the Blue Chair Bay website and search for a store that carries it near you, using their Rum Locator. But if you want to roll the dice and try winning a bottle first, then simply follow the directions below! (Since it's Banana Lover's Day) What is your favorite thing to make with bananas? What do you think you'd make using the Banana Rum if you're the winner? Once you've answered that question in the comments section, be sure to verify it in the rafflecopter widget, which will then open more optional entries! This giveaway is open to residents of the USA who are 21 years or older (by entering this contest, you certify that you are at least 21 years of age). Submissions close at 11:59 pm ET on Tuesday, September 2, 2014. A winner will be chosen from qualifying entries via random draw, and notified via email within 48 hours of the close of this contest. The winner will have 24 hours from the time the email is sent to respond to me with a statement verifying that they are at least 21 years of age and their complete name, mailing address, and phone number. If no response is received within 24 hours, a new winner will be chosen. 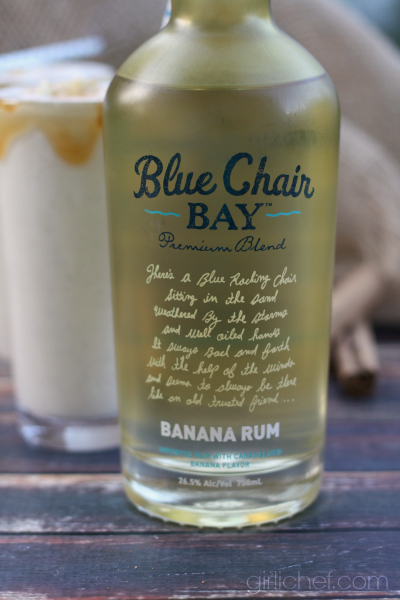 I received a free bottle of Blue Chair Bay Banana Rum for sampling and recipe testing purposes. Blue Chair Bay will also be providing the bottle of rum to the contest winner. All opinions stated in this post are my own.